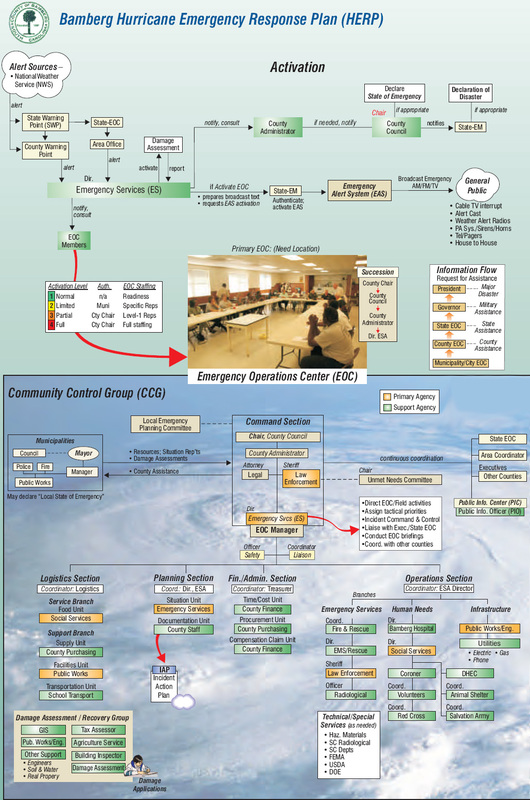 Having a formal Plan encourages an integrated approach to disasters, and fosters prompt, efficient and coordinated response operations by the different elements of the emergency organization. It requires a system-wide integration of skills, people and resources. By pre-defining roles for each response agency reduces confusion, chaos and conflict during an emergency and significantly decreases vulnerability of the public and their property to hazardous threats. The HERP assigns responsibilities for actions to be taken at the local level by government and private organizations to reduce vulnerability to disaster and to establish effective response capabilities. The plan provides for alerting elected officials, the evacuation of the public from potentially dangerous areas, and the designation of shelter areas for evacuees. It also provides for the re-entry into evacuated areas when appropriate. This Plan is subordinate to the County EOP and is to be used in conjunction with each relative section. 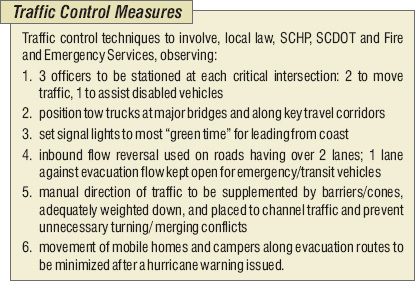 Consistent with the model provided in the National Response Plan (NRP) and National Incident Management System (NIMS), the Plan can be partially or fully implemented for an anticipated or actual disaster. 1. Storm surge – is a large dome of water often 50-100 miles wide that sweeps across the coastline near where a hurricane makes landfall. The surge of high water topped by waves is devastating. Stronger the hurricane, higher the surge. Storm surge is the greatest threat along the immediate coast. 2. Hurricane winds – can destroy buildings, mobile homes, and other property. Debris, such as signs, roofing material, siding, and other items become missiles in a hurricane. Wind is the greatest cause of property damage inland of the coast. 3. Rainfall-induced flooding – widespread torrential rains, often in excess of 6 inches, can produce deadly and destructive floods. 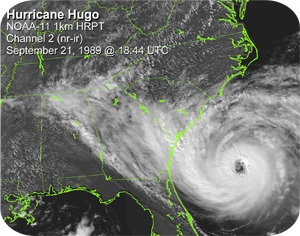 Long after the winds have subsided, hurricanes can generate immense amounts of rain. 4. Tornadoes – are a threat in all quadrants, but primarily develop in the northeast quadrant of the storm, possibly as much as 200-400 miles from the storm's center; can potentially become very strong, causing extensive damage to buildings and loss of life. 1. 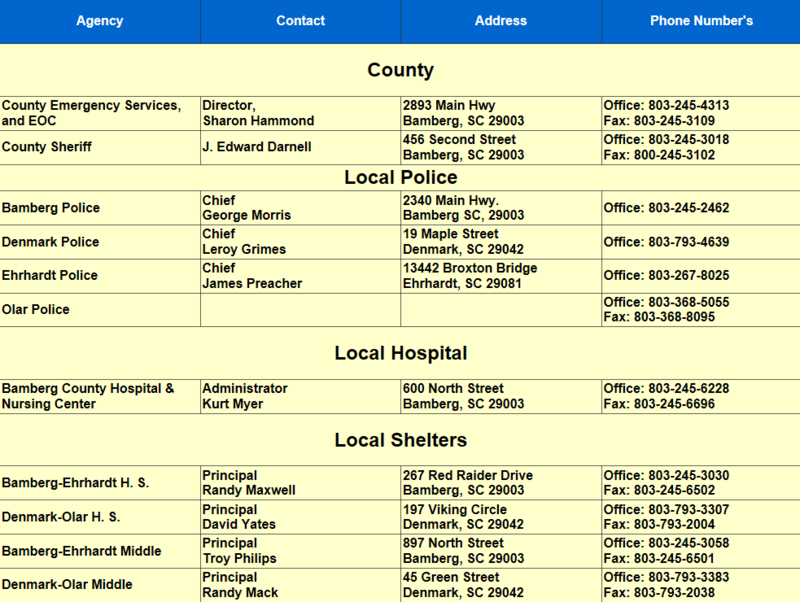 A major hurricane will threaten nearly everyone in the county. 2. Emergency response personnel (e.g., Fire/EMS/Law Enforcement/ Emergency Mgmt) available to assist with evacuations and re-entry. 3. Most residents affected will cooperate with local officials and follow recommended protective actions, such as evacuation instructions for relocation to designated reception/shelter areas. a. Private automobiles, school and other buses will be the primary means of transportation for evacuation. Available alternate transportation would be coordinated to support evacuation of public without transportation, special needs individuals (e.g., handicapped, mobility impaired, developmentally disabled) and elderly. b. Initial movement of population(s) at risk will occur after issuance of an evacuation order by local and county officials. 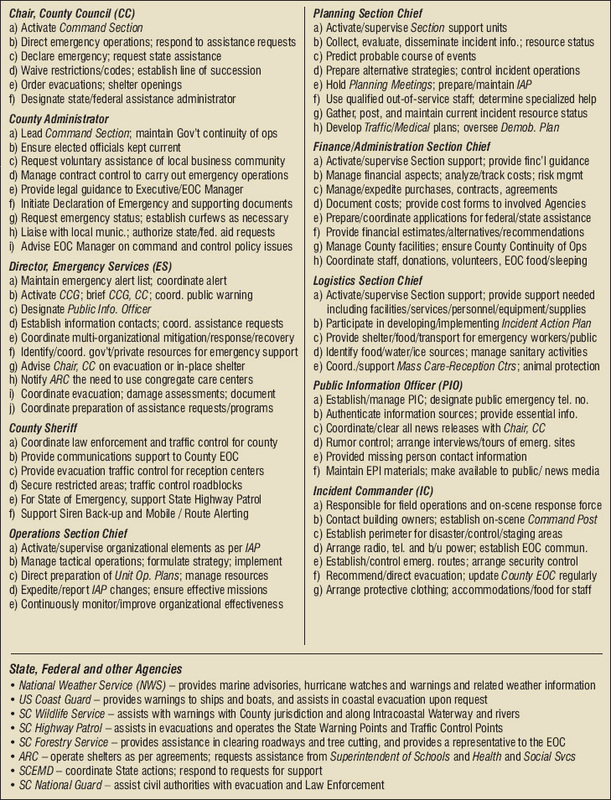 Emergency response personnel are to familiarize themselves with the SOPs for Emergency Personnel, the Fire/EMS/Law Enforcement for Disaster Response and the County EOP for Multi-Hazards. 1 74-95 No real damage to building structures. Damage primarily to unanchored mobile homes, shrubbery, and tress. Some coastal flooding and minor pier damage. Some roofing material, door, and window damage to buildings. Considerable damage to vegetation, mobile homes, and piers. Coastal and low-lying escape routes flood. Small craft in unprotected anchorages break moorings. Some structural damage to small residences and utility buildings with a minor amount of curtain-wall failures. Mobile homes are destroyed. Flooding near the coast destroys smaller structures with larger structures damaged by floating debris. More extensive curtain-wall failures with some complete roof structure failure and small residences. Major beach erosion. Major damage to lowers floors of structures near the shore. 5 155 or Higher Complete roof failure on many residences and industrial buildings. Some complete building failures. Catastrophic damage throughout the area of impact.